Former Nigerian First Lady, Mrs Maryam Babangida, was buried in the early hours of this morning beside the mosque at the family compound, Minna, Niger State. Her husband and former military president, General Ibrahim Badamasi Babangida (IBB), could not contain his emotions as prayers were being said for the deceased. He wept as the Chief Imam of the Minna Central Mosque, Ibrahim Fari, prayed for the repose of the soul of Maryam. He was consoled by former head of state, General Abdulsalami Abubakar, who patted him on the back. Widespread reports that she would be buried today might have forced the family to bury her earlier in order to curtail the influx of sympathisers to the venue. The corpse arrived Minna at 11.45 pm, accompanied by the Secretary to the Government of the Federation, Alhaji Ahmed Yayale, who led the Federal Government delegation. Others who accompanied the body are Minister of Sports, Alhaji Sani Ndanusa, son-in-law of the deceased and Zamfara State Governor, Alhaji Aliyu Shinkafi, and Maryam's second son, Aminu. Islamic prayers commenced at 12.45am, led by the Chief Imam of the Minna Central Mosque. Her body was finally lowered into the grave at 12.55am, amidst chants of "La illa ill Allah! ", meaning: "There is no God but Allah". IBB was accompanied to the graveside by Yayale and former head of state, General Abdulsalami Abubakar. 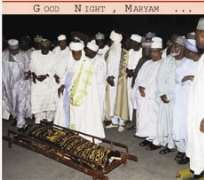 A family member told THISDAY Maryam was buried late into the night because security operatives might not have been able to handle the crowd of sympatisers. Even then, the crowd that stayed late into the night was sizeable as sympathisers gathered in anticipation of the burial following the setting-up of floodlights and the digging of a grave by the mosque. Her body was brought in through the back gate because of the crowd that had gathered outside the front gate to the compound. Babangida had arrived Minna International Airport yesterday in a private aircraft without the remains of his wife. He was in tears as friends and associates came to receive him, on his arrival from the US via Germany in a DASSULT Aviation Aircraft with registration number CS-DPF. He disembarked from the aircraft at 5.45 pm. Babangida, dressed in a navy blue caftan, was accompanied by his first son, Mohammed, who was dressed in a black suit. Before the arrival of the former president, his second son Aminu and his son-in-law Governor Shankafi, had boarded another private aircraft and left the airport for Abuja to bring the corpse to Minna in an air ambulance. Those who received Babangida at the airport included the Niger State Governor, Dr. Muazu Babangida Aliyu; Delta State Governor Emmanuel Uduaghan; Osun State Governor Olagunsoye Oyinlola; former head of state, General Abubakar; and Chairman of THISDAY Newspapers, Mr. Nduka Obaigbena. Others were former Central Bank of Nigeria (CBN) governor, Professor Chukwuma Soludo; Senator Bukar Abba Ibrahim; former military governor of Lagos, Brig-Gen Raji Rasaki; former governor of old Anambra State Jim Nwobodo; Alhaji Aliko Dangote; and Brig-Gen Anthony Ukpo. Also there were Umar Shankafi, Capt. Nogie Megason, Tayo Amusan, Governor of Kaduna State, Namadi Sambo, Brig-Gen John Shagaya, Chief Tony Anenih, wife of Kwara State Governor, Mrs Toyin Saraki, and former governor of Sokoto State, Alhaji Attahiru Bafarawa. Babangida's wife died last Sunday at the age of 61 in the US after a long battle with ovarian cancer.